This was a strong double bill of two quite different bands. Disco funk legends Earth, Wind and Fire opened the show. They had just released the album “That’s the Way of the World” and were massively successful in the USA, if less well known in the UK. I remember them having a big show, with lots of people on stage, and the highlight was a revolving drum kit (you had to see it to believe it 🙂 ). Santana had a lot to follow with such a strong opening act, but Carlos and the band rose to the occasion playing a set that included favourites like Black Magic Woman, Samba pa ti and Soul Sacrifice. 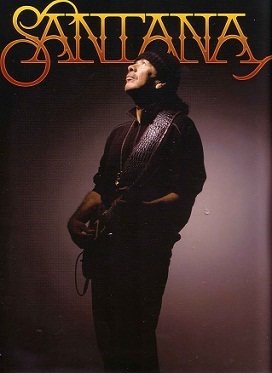 The tour came between Santana’s sixth album “Borboletta” and their seventh “Amigos”. I recall that the concert was sold out and Marie and I went along without tickets. We managed to get two single seats, and spent the evening watching the concert standing at the back of the hall. 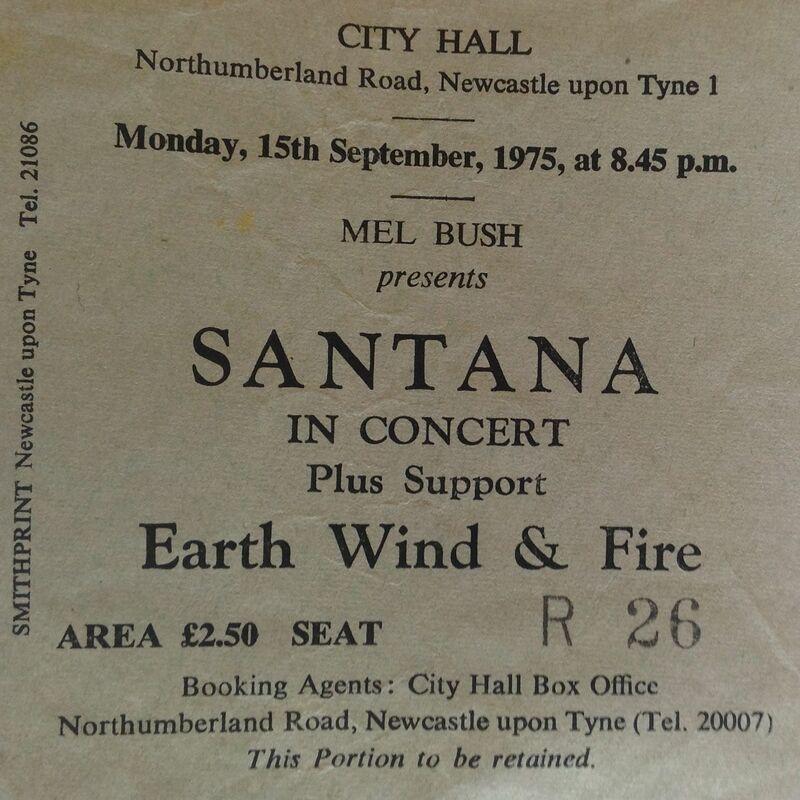 The next time I saw Santana they were special guests for Bob Dylan at St James Park Newcastle, on 5th July 1984. Santana’s set at this massive open-air gig was Touchdown Raiders; Spirit; By the Pool; Samba pa ti; Breaking Out; Gypsy Queen; Incident at Neshabur; Waited All My Life; Two Points of View; Brotherhood; Savor; Who Loves You; Open Invitation; She’s Not There; Europa (Earth’s Cry, Heaven’s Smile); Right Now. My memories of the gig are also of an enjoyable concert. I’m pretty sure that they also played “Samba Pa Ti”. Their visit covered only two UK cities, Newcastle and Manchester, as part of their 1972 European tour (not sure how it could be an “Exclusive Northern appearance” when they also played Manchester 🙂 ; but maybe it was at the time the tickets were printed). 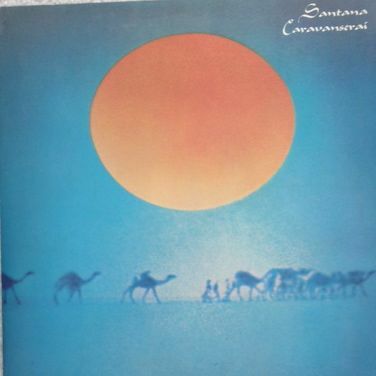 Santana had just released their fourth album Caravanserai, and as John says it was a sharp departure from his critically acclaimed first three albums. We were all familiar with Santana at the time because of their excellent storming performance of “Soul Sacrifice” in the “Woodstock” film. 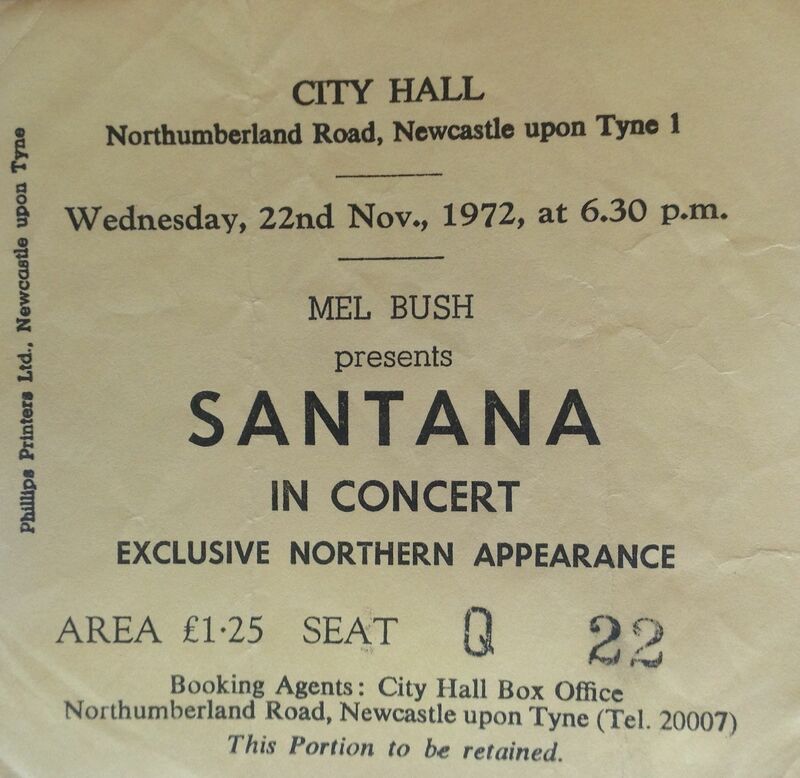 By the time John and I saw Santana and his band in Newcastle their musical style had changed considerably from the band we all saw and loved in “Woodstock”. I recall being quite surprised by the difference, which was moving the music closer to that which John McLaughlin was pursuing in his Mahavishnu Orchestra. Santana’s exquisite guitar playing shone out, as it always does, to this day. I also remember that Slade were performing at Sunderland Top Rank that evening, with Thin Lizzy and Suzi Quatro as support acts. As we returned home after the Santana gig, which will have bee finished by 8.30pm to allow for the late show, we could see people entering the Rink (aka Top Rank) for the Slade gig. 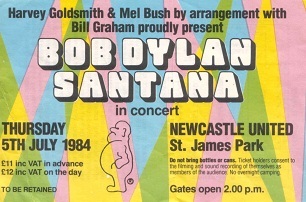 Dylan was back in the UK in 1984 for a couple of concerts, one at Wembley Stadium and this time he also visited the North East for a massive gig at St James Park, with support from Santana and local heroes Lindisfarne. I went along with a group of friends. I remember Lindisfarne going down well with the crowd (well they would, wouldn’t they!). I can’t remember a lot about Santana, to be honest. Dylan played a set of classics and got a good reception from the Toon crowd. He was sporting a strong band with Mick Taylor on guitar, and Ian McLagen on keyboards. I think Carlos Santana also joined the band on guitar. Looking back on those shows, we didn’t know how lucky we were at the time. Dylan was singing well, and performing long sets which covered his entire back catalogue. Santana were a lot lot better than I had expected. I’d seen them a couple of times at the City Hall in the 70s and they also supported Dylan at St James in the early 80s. My recollections of those shows were that they were OK, but some of the songs were drawn out and samey. So I wasn’t certain about going to this, but decided to go along on the night. I managed to score a £63 ticker for £35 outside, so was quite pleased at that. And in the end I was glad I made the effort because it was much better than my memories. The set was a mix of early Woodstock-era Santana, recent latin-based material and some covers from the latest album. Plus some semi-religious words of wisdom from the man himself. All of this made for a great show. Great guitar, great rhythms, great singers, great use of video. For the early songs Carlos played in front of videos of himself at Woodstock-wonderful stuff! I even enjoyed the drum solo(s!)! Highlights for me were Black Magic Woman, Samba Pa Ti and Soul Sacrifice.